← Discipline in the Martial Arts and Hanging the School Teacher! 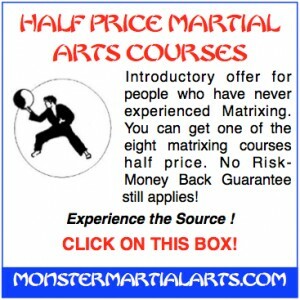 Half Price Martial Arts Course Is Going Great Guns! Great Guns, I say. But, if anybody knows what it costs me to make my Martial Arts courses, print them on CD and DVD, figure out advertising, mail them…lot of time and cost involved. And that doesn’t even come close to describing the near 45 years experience that is being poured into those courses. Of course, it is all worth it, because I simply love the martial arts. You know, funny thing, when you think about it. Love. I love the martial arts, but what is love. Most people think about men and women, and a guy who loves something like the martial arts, what does that really mean? Well, love is a contract. You love a girl you make a contract with her. Be true, treat fair, that sort of thing. And girls have their own obligations under the contract. No wonder they get so pissed when a guy doesn’t live up to his contract. Bad thing, that. Got to live up to your word. Anyway, I love the martial arts, and that means I made a contract with a whole field of study, a whole arena of motion. All that energy poured into the martial arts over the millennia, I made a contract to pour more into it. And, the return, I get to pull certain energy out of it. I am granted authority, knowledge, and a certain status within the ranks of those who have built up this field over the ages. The return, to me, is worth it. Some people, they shouldn’t mess with the martial arts, they are trying to pull energy out, without putting anything of worth back in. Doesn’t matter to me, I’m where the sun shines. Of course, it sure would be nice if others saw this, came to this high plateau and saw the truth of the martial arts. So that’s my contract: to try and get others to raise themselves up, feel the aesthetic spirit of the true fighting disciplines. And that’s why I’m offering the Half Price Martial Arts course. And that’s why it is going great guns.